Amsterdam, c.1700. 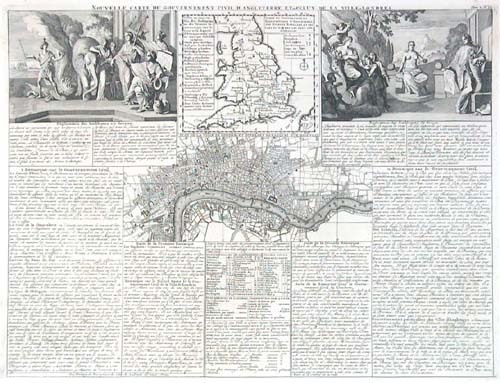 Map of London, another of England marking the Cathedral cities, with two allegorical scenes with explanations. With extensive engraved French text. London, c.1720. 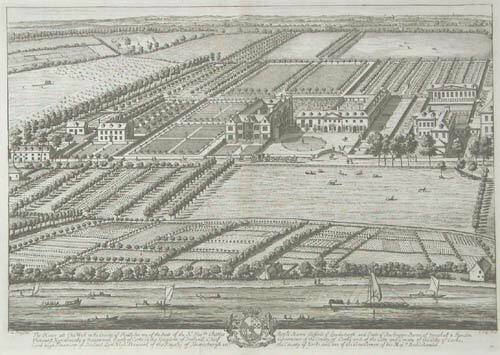 A bird\'s eye view of Chiswick House, surrounded by fields and with the Thames in the foreground. 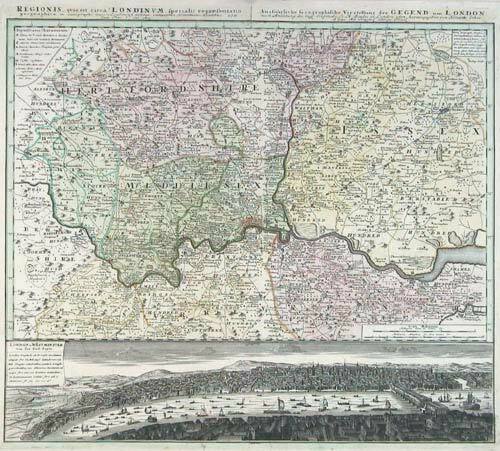 An attractive view of West London nearly three hundred years ago. Nuremberg, 1741. Map of the commuter belt of London, extending to Maidenhead in the west, Luton, Chelmsford & Leatherhead. 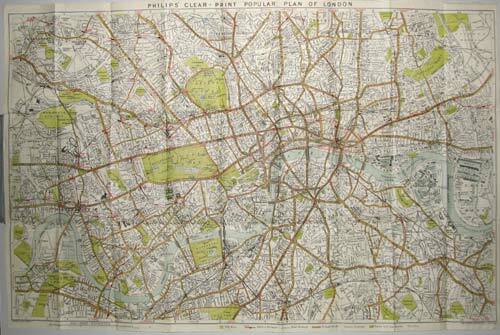 Under the map is a panorama of London showing from Westminster to the Tower. London, c.1776. 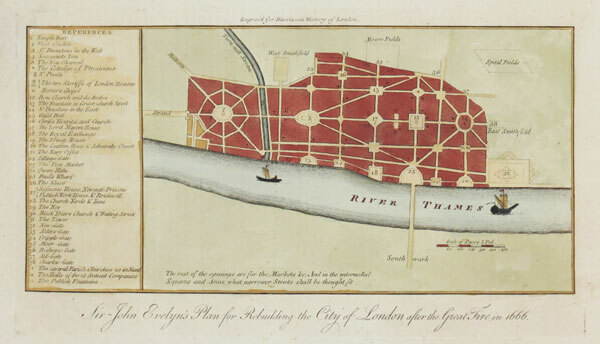 After the disastrous fire of 1666 both Christopher Wren and John Evelyn submitted comprehensive plans for the rebuilding of London. This plan shows Evelyn's attempts to promote a linear road system, with regular open junctions suitable for markets, marked with a 38-point key. However both schemes failed, due to the nightmare of private ownership, astronomic cost predictions and the need to get the City operational as soon as possible. 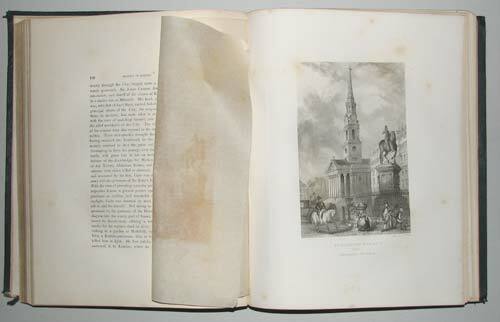 Published in 'Harrison's History of London'. Vienna, 1789. 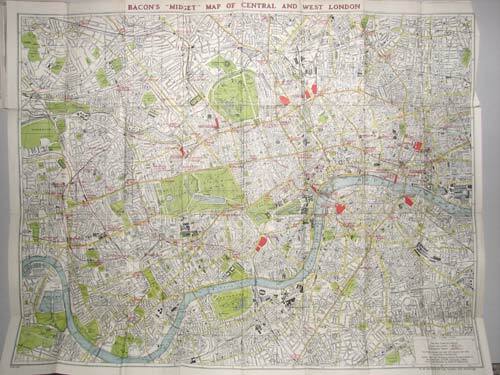 The environs of London, to Hampton Court, Enfield, Upminster & Carshalton. London, c.1795. Originally published in 1751, this example comes from a compilation volume issued when Boydell became Lord Mayor of London. London & Liverpool, c.1930. With ink ownership mark dated 1930. London, 1803.. 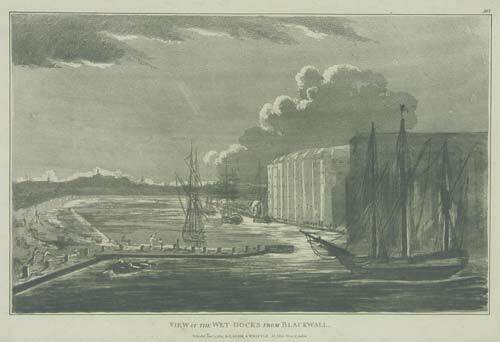 Apparently a view of the West India Docks, completed in 1802. 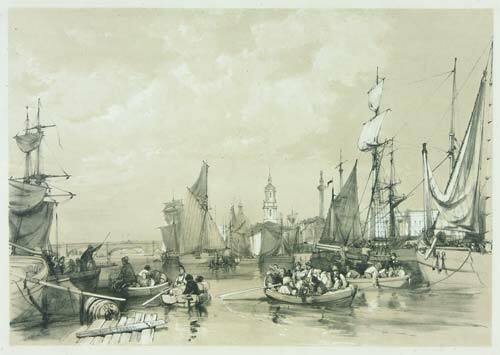 The use of aquatint is unusual for Laurie and Whittle. London, 1756. 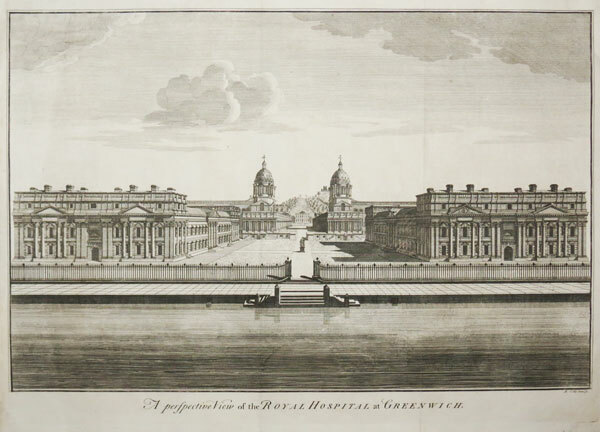 A view of the Royal Hospital, now the Royal Naval College, from the Thames, looking between Wren's two buildings to the Queen's House and Flamsteed's Royal Observatory on the top of the hill. Engraved by Benjamin Cole for Maitland's 'History Of London'. London, 1768. A view from Richmond Hill towards Twickenham, with Ham House, Marble Hill House & Orleans House. London; Society of Antiquaries, 1753. 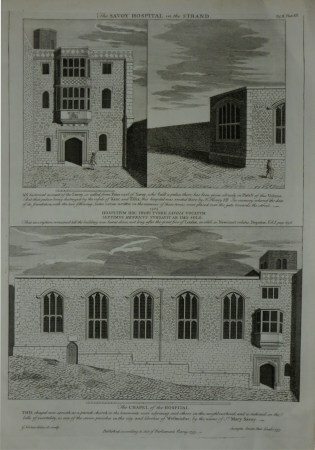 Three views of the Savoy Hospital for the Poor, created by Henry VII in his will and opened 1512. The Chapel, illustrated at the bottom, is the only building to survive the demolition of the Hospital in the C19th. One of the final prints engraved by the prolific George Vertue (1684-1756) for the Society of Antiquaries's 'Vetusta Monumenta'. View of St Paul's Cathedral. 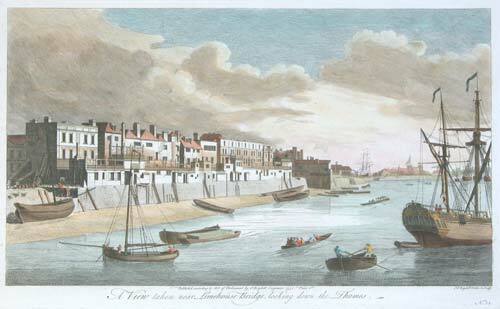 London, c.1760. With a short history engraved under the view. 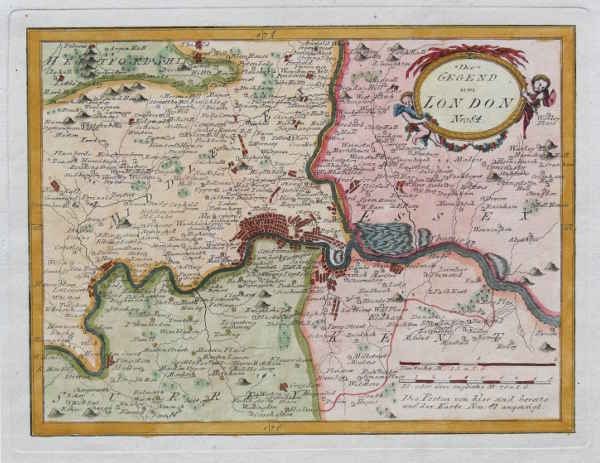 London: John Bowles, c.1760. A view of the Temple in London. London, 1808-1810. 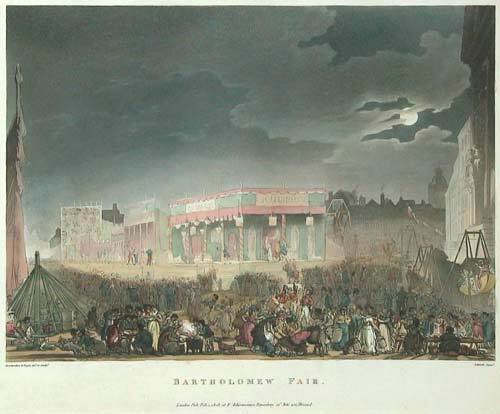 A print of a summer fair in London, held from the 12th century to 1855.